Posted: Sat Dec 10, 2005 8:09 pm Post subject: [Practice] Making it work. 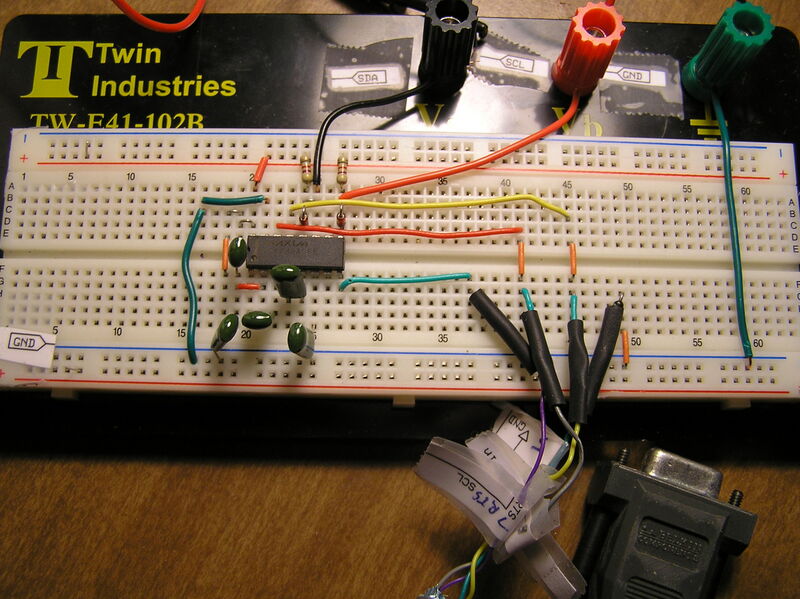 An old guy's interpretation of Victor's driven circuit diagram into a working breadboard. 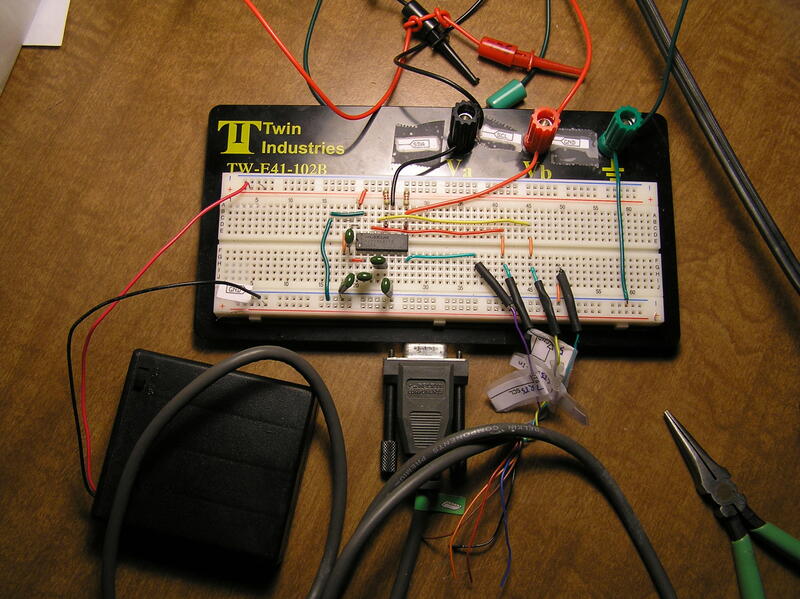 I used a breadboard for ease of wiring and figuring the circuit out. It took a few tries; been over four decades since I built a ham radio from scratch. I had a friend with a steady hand and fine-tipped iron solder on the wires to the 24RF08. (Note that the ground wire doesn't have to be soldered to the chip; you can clip to anywhere grounded metal on the frame.) I used fine Kynar coated magnet wire to go to the chip, taped it down, and then re-inserted the memory chips and gently put the door cover in place. The laptop needs to be right side up for the final steps <grin>. I used mini-grabber test leads to go from the breadboard to the leads from the 24RF08. They have very secure clips. Since their connection wires are stranded and the board wires are solid, I used the binding post connectors on the Twin Industries breadboard to connect them to jumpers from the board. To connect to the serial port, I just cut the end off an old modem cable, stuck pins in the holes until I found which wires matched up with the four that were needed, and then soldered solid jumpers to these wires. This way I had a nice long cable with a good connection at the port end. Also, my cable plug was conveniently numbered (needed magnifier). Note that the sequence is, connect the serial port, power on the 5V circuit, power up the laptop, connect the test leads to the wires from the security chip, run r24rf08.exe. Be sure to follow all of Victor's other cautions and instructions. I'm sure there are lots of ways to realize Victor's design (which he modestly says is "just a classic max232 usage diagram" into a working circuit, and this surely may not be the best one. However, it did work for me, successfully reading the contents of the AT24RF08 security chip from my T22. Then the IBMPass2.exe read the .bin file and translated the scan code and gave me the correct supervisor password. I can't say enough for Victor's generosity and skill. Like many, I searched the net for a solution to get into my laptop after the CMOS battery died. Having his circuit diagram was great; I hope someone will benefit from seeing how this old guy translated it into a working design. The Electronics Club at Kelsey School. Lots of good info on theory and practice. Based on my understanding of how these plastic breadboards work, I think that diodes D1 and D2 are just shorted out above a breadboard "wire" and not really in the circuit with the breadboard layout as shown. It's that way on the PDF breadboard diagram and in the picture as well, but not in the schematic. thx for the post, can we get some of the photos updated, the links are dead. Thanks for the tip on the diodes; I'll check it out. All I know is the the board as pictured worked just fine on my T22. I'll confirm with Victor and revise as needed and put up new diagrams/pics if revisions necessary. On the links, I don't know why they just went dead. If I can't get my hosting site working I'm going to send them to Victor so he can host them off of this site. Sorry for any confusion/delay. thx for the pictures, it helps. I've been having a heck of a time, trying simple and driven. Your photos were a great help though. I've been trying to mold some sort of a cap to fit on top of the chip with 3 pins (or needles) to make the connections without soldering. Just put the mold on, press down and then remove it Can't find the exact type of material that will make a good negative impression of the chip. Then oke the needles through it at the right locations of course. There is indeed an error in the diodes; Victor will post an explanation; I'll fix the drawings. About a cap--3M makes testing clips for many IC chips that do just what bassclef proposes, but I searched many electronic catalogs and was not able to find one small enough for the 24RF08. Search IC test clip and see what you find--it is an attractive idea. Another thought is to take a six pack of good beer to a skilled soldering guy (or gal) and offer to trade for the three connections you need! I'm going to attempt the cap tomorrow. I'll update all with my results. so far i am using the "tack" stuff you use to stick pictures to the wall. It seems to make a good negative impression. I put it in the freezer for a few minutes to make sure it retains its shape, but i don't think its going to work if the chip gets heated, then it will be like bubble gum. Got the laptop off of eBay for CHEAP. Had seen this forum previously and decided to give the R24RF08/IBMPASS2 procedure a try. 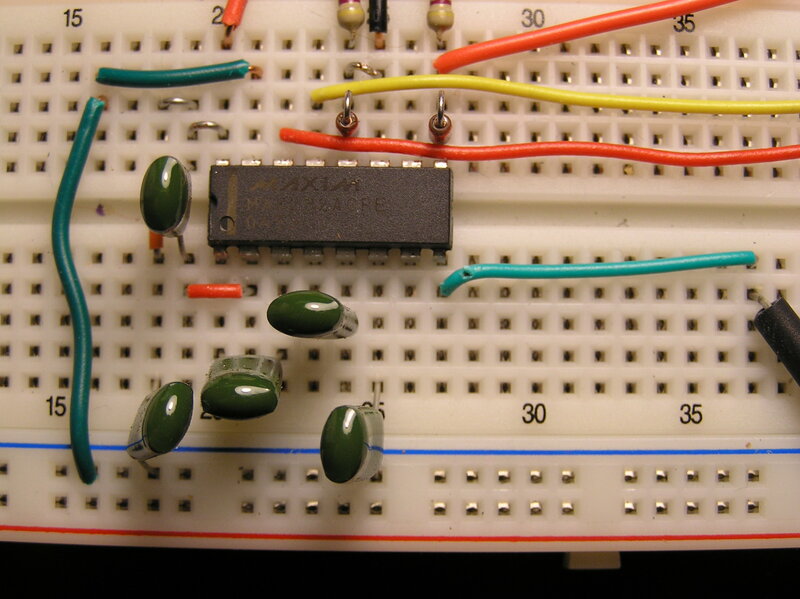 Built the MAX232 driven interface on a small breadboard, used another one of my 600X laptops as the reading/decoding machine. Spent a LOT of time trying to figure out where the Atmel 24RF08 EEPROM was. 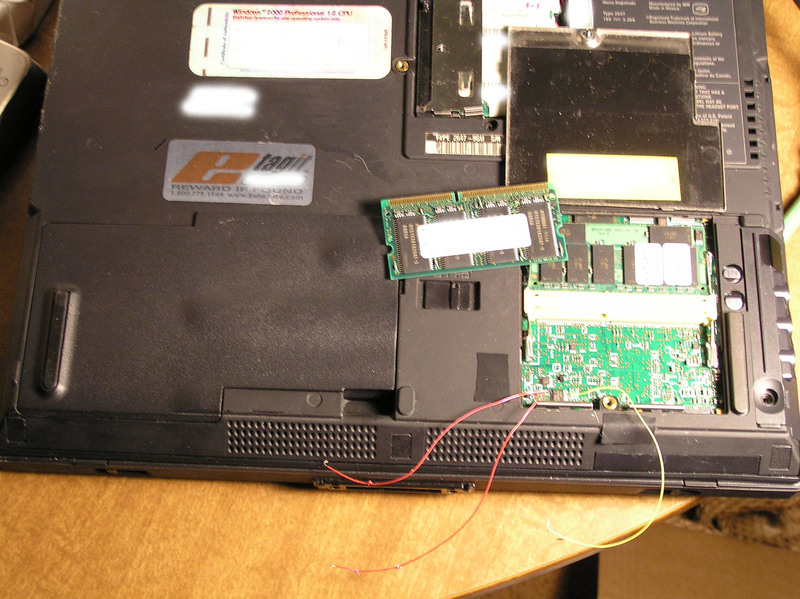 With a confirmation of my guess that the EEPROM was on the back side of the motherboard, tore the laptop completely apart, located the little bugger, soldered the three wires to the board, partially re-assembled the laptop and ran the two pieces of software which gave me the CORRECT supervisor password. The laptop is now fully back together. System clock has been accessed in BIOS and correctly set (no more 161 and 163 errors). Supervisor password has been REMOVED. It has run several memory diagnostic checks and passed. It has booted a spare WinXP hard drive that I had laying around (and triggered the Windows Product Activation "feature", bah!). My thanks and "tip of the hat" goes to Victor for posting this information. It does work. It does require some degree of skill in taking apart the laptop and in constructing the interface circuit, but it is worth it. Excelent review with good pictures and very well written. We strongly suggest anyone to read it. You'll find a lot of details that would help you understand better the procedure and avoid making mistakes. Victor. Splendid documentation, Ray!. I was about to add using the screw pads for ground connection (as I did) to minimize connection to the tiny ic pins but you already mentioned it in your webpage. 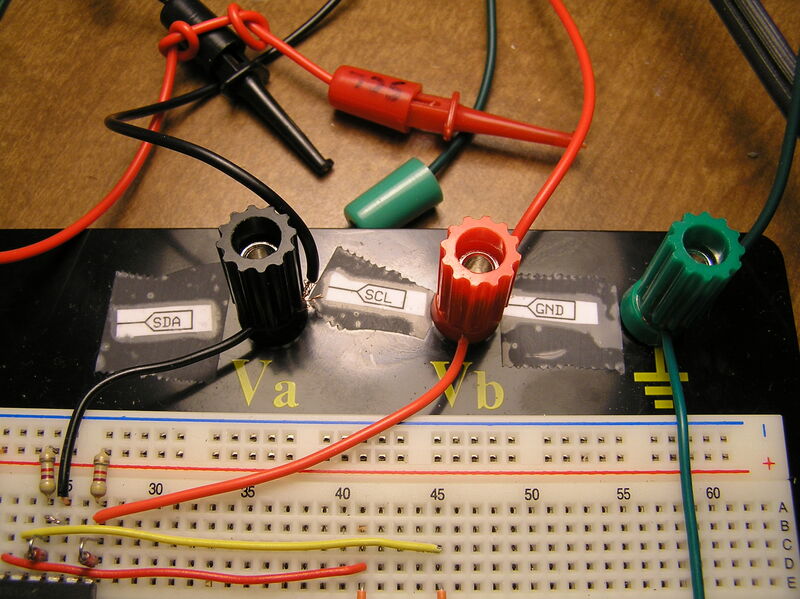 I have a couple more tips for would-be tinkerers. 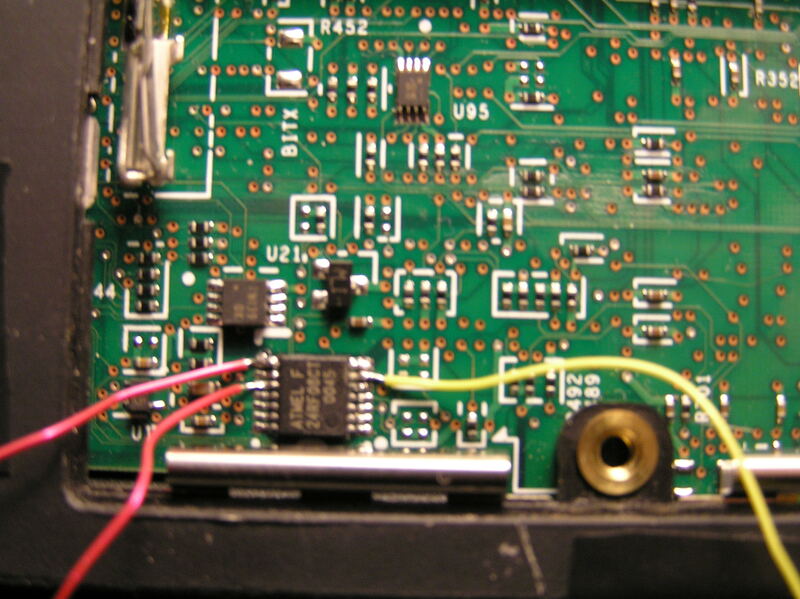 For the 600e (this time the 24rf08 is on the top of the motherboard, above-left of the battery terminals for my model) there is a via close by that leads to pin 10 of the chip so i used that one for connecting the #30AWG tefzel wire. It is much easier than connecting to the ic pin. I had to scrape the varnish over the hole and clean the copper to bright metal with needle-point Exacto trimming knife to ensure a good connection. My pocket 10x loupe came handy too to make sure there are no solder micro bridges when the wires were connected/unconnected. And what added to the adrenaline rush seeing the OK message after keying the revealed password is seeing the padlock icons open for the hdp and svp at the password page in the bios. I was able to redeem a locked 10gb paper weight . It is much easier than connecting to the ic pin. Agreed. I spent about an hour looking for alternate locations where I could tap into the SDA and SCL signals from the topside of the motherboard. That way I would not have to go through the trouble of removing it from the case the next time I do this. It wasn't easy holding a lead from an ohmmeter on the SDA pin (I hadn't solder on the wires yet), turning the motherboard right-side up, and then using the other ohmmeter lead to randomly poke around, hoping for a "beep". I did get one, however. It was on a chip that is next to the docking port connector, just below the CPU/heat sink board. As I said in my web page, that part also has the (15-20mil?) lead spacing as the 24RF08, and it was about 5 legs in from the corner of the package so it was actually harder to solder to than pin 8 (on the corner) of the 24RF08. (Although now that I'm thinking about it, it was the same difficulty as pin 10 of the EEPROM. And it would mean that I don't have to remove the motherboard... Hmmm... Maybe next time.) So I gave up looking. That, plus I was anxious to proceed with the password recovery. If I get around to doing this again (buying an eBay test case), I'll spend a little more time and prepare better for probing the motherboard, like borrowing one of the PC board holders from work and soldering on the wires to the EEPROM before poking around. Oh yeah, and a pair of magnifying glasses! I had to take my contacts out to see well enough to solder onto the 24RF08. very well written, and presented tutorial on your process! please post pics of the alternate locations for trces to the ic pins, that would be a great help. I'm already looking around eBay for a 600X motherboard that I can play with. I do not want to rip apart any of my working systems and risk damaging them by blindly poking around with my multimeter. I hope to have something to post in the next few weeks. Basically, I have found places to tap into the SDA and SCL signals from the top side of the motherboard. You only have to remove the keyboard and CPU/heat sink assembly to get at them.